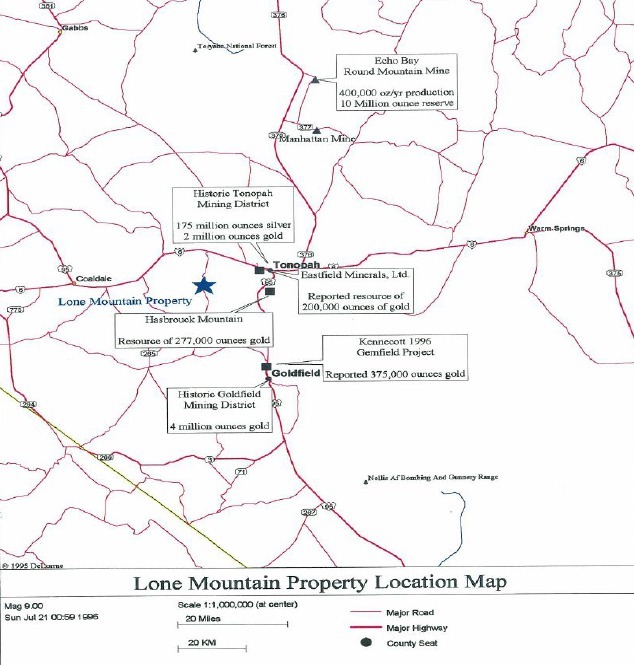 Northern Sphere Mining Corp. (CSE: NSM) (OTCQB: NSMCF) (“Northern Sphere” or the “Company”) is pleased to provide an update on its Lone Mountain Nevada Property (“Lone Mountain”). Located 24 kilometers west of the mining town of Tonapah, Nevada (Figure 1), Lone Mountain displays encouraging early polymetallic assay results. Estimates contained in Figure 1 use categories other than CIM definitions for mineral reserves and resources. Mineralization hosted on the deposits in Figure 1 is not necessarily indicative of the mineralization that may be hosted on the Company’s property. Northern Sphere has contracted Goldeni Investment Intelligence to complete a NI 43-101 technical report on Lone Mountain. 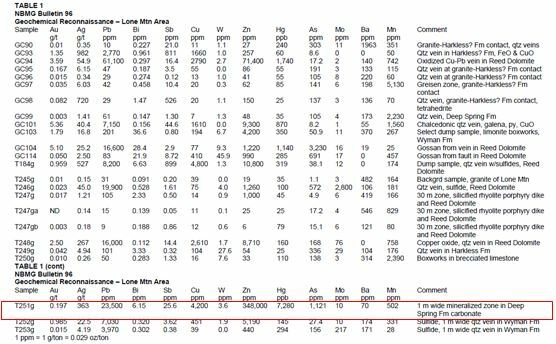 The 2011 report by the Nevada Bureau of Mining and Geology includes geochemical assay results (from both grab samples and over a 1 metre-wide mineralized quartz vein as disclosed under the Comments heading) (Table 1) that highlight the potential for a significant porphyry style deposit. Figure 1. The Lone Mountain Nevada Property, 24km west of Tonopah, Nevada and 8 km south of U.S. Highways 95 & 6 in the Lone Mountain mining district. Table 1. Geochemical anomalies of lead-zinc-silver mineralization present as replacement bodies along fracture zones in carbonate rocks of the Reed Dolomite and Deep Spring Formation in the area. 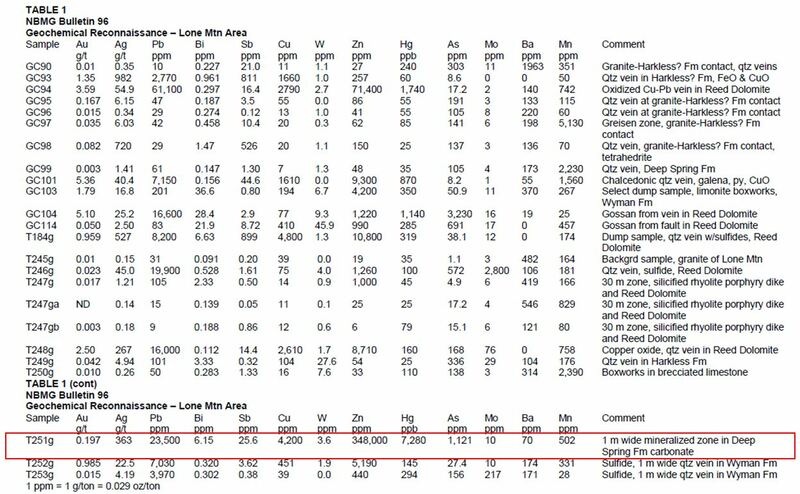 Assay number T251g (outlined in Table 1, taken by Bonham & Garside The Nevada Bureau of Mining and Geology) included 35 % zinc, 363 g/t silver, and 4,200 ppm copper on a 1-meter wide vein at surface. ‎Other assays show continuity over a significant area. The amount of cobalt, platinum, and palladium are currently unknown without further exploration, but all elements are expected to be present in some amount. The Company intends to complete an exploration program that will include a review of all historic data, surface reconnaissance, mapping and sampling to confirm historic findings and direct future programs to help define the potential of these mineralized prospects and the best way to advance the property. Given its location relative to major companies, such as Newmont ‎and Kennecott, the Company believes that it can obtain the necessary data to complete a NI 43-101 technical report quickly. Ron Wortel P.Eng. an independent Qualified Person as defined by NI 43-101, has reviewed and approved the contents of this news release on behalf of the Company. Given that the 2011 report bythe Nevada Bureau of Mining and Geology was authored by a U.S. government agency, the 2011 report has not been independently verified. However, Mr. Wortel will be providing consulting services to the Company for the preparation of the NI 43-101 Technical Report on the Company’s Nevada Properties through his personal consulting company Goldeni Investment Intelligence .